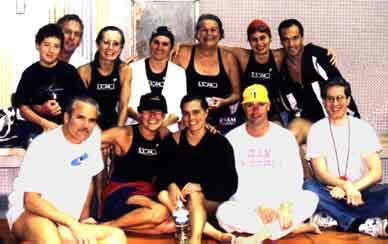 n late 1989, I was playing around with the idea of joining a Masters swim club. I was 38 years old, and had for years been involved with different sports. In the 70s, it was the running/10k/marathon mania. 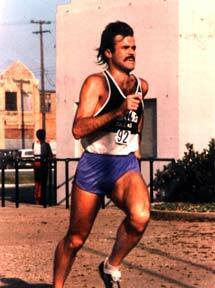 I'd run a 34:50 10k, a 16:19 5k on the track one night in a time trial, 3 marathons. Never too well in the marathons, I'm too big. 6'3", 175. From running as much as 90 miles a week, though more consistently 50 to 65 miles, and doing frequent track workouts, I developed a set of the usual runner's injuries that eventually sidelined me in the spring of 1983. I realized I would have to just lay off my feet until the complex of lower limb injuries was healed. So I started riding a bike and swimming in order to burn off the hyperactivity that had become part of my answer to depression, sadness, fear. Very soon I discovered the endless training possibilities involved in the newly growing sport of triathlon. A person could concievably spend a whole day working out! Great! This was for me. I could drink all the beer I wanted without having to feel like an alcoholic, because I spent so much time working out! Perfect! I went to the pool at SMU and swam one 50 meter length, and felt as though I had just done an English Channel crossing. I'd not swum regularly since I was a scared, unwilling age group swimmer from the ages 10 through 13 on the Oak Cliff Swim Club. The difficulty of the swim intrigued me, since I was in great cardiovascular condition, all of which I needed. As part of my recovery from running injuries, I visited the pool regularly, and eventually trained enough to swim the 1.5 mile swim leg of my first triathlon. That event was President's/First Ladies Health Club Triathlon, at Lake Lavon in Plano, Texas. I competed in the long course event, above-mentioned 1.5 mile swim, a 45 mile ride, a 10 mile run. I did fairly well in the race, had not trained the run enough and though I averaged a 7:00-minute mile, I nearly collapsed with cramps at the end. The massage guys got me where I could drive home. With my Irish Catholic appetite for pain, it took me two more of these damned things (triathlons) to realize that I really hated them. But I loved the cycling. hile still involved with triathlon, I had joined the fledgling Mirage Cycling Club in late 1983. I rode in a citizens' race (an organized race for riders who had not obtained licenses from the United States Cycling Federation). I placed 3rd or 4th and was gleefully happy. Bike racing was a new level of daring-do, adrenalin, addictive speed, gorgeous delicate machines. It was like sportscar racing, complete with crashes, danger, excitement, only YOU were the motor. After years of running, I had a big motor. But having a big motor is only part of the sport of cycling. I quickly left the triathlon thing and dove headfirst into bike racing. I drove around everywhere with my bike disassembled in the back of the car, ready to ride. My first real licensed bike race was a 30 mile road race down in the hills outside Austin. I decided in runner-think to let the rabbits go off the front and then pick them up with my aerobic power in the back half of the race. The gun went off and a group of 10, maybe 15 riders absolutely exploded off the front of the pack, never to be seen again. The winner was decided in that group. What I quickly and unceremoniously realized is that a group of cyclists working together is faster and more powerful than any individual. I learned right away that you have to be in the lead group at the gun, or you are lost. The all or nothing nature of this sport got my attention, and pulled me in. I was fairly successful as a racer. I came about that close to becoming a true bike bum, but had too much responsibility to my wife and family and career to go all the way. I won a time trial, placed in the top 3, top 5 consistently. Once, I thought I had the win in a road race in my pocket. It was a 25 or 30 miler, out in the country outside McKinney Texas. It was a fast race, and several colleges had sent their cycling teams. I was very active in the front of the pack, setting the pace, attacking, pulling back, just really messing with people. Once, two of the college boys rode off the front, and got way out there, working together and making what eventually looked like a significant break. No one would chase them down. Finally I went after them myself, riding away from the pack and crossing the kilometer or so of ground up to them with freight train-like power. was really on my game that day, and I could see how surprised they were when a lone rider got up to them and yelled GO! so we could stay away from the pack. Alas, they were shot from their efforts, and couldn't do the work to stay away. I tried pulling them for awhile to let them recover, but we were eventually swallowed by the pack. I sat in the group, realizing it would just come down to a sprint. This time, I was going to wait for the sprint. I would look for a lead out, rather than breaking the wind myself. We got down to the finishing straighyaway. A half mile out, things started to pick up, and you could feel the adrenalin spread through the pack. This was a group of good riders, and they were like jackals for the win. People started jockeying and lining up where they wanted to be. 300 yards and the first guy stands on his pedals and goes, then one or two others, and suddenly, it is the wild, mindless, headlong, fully committed, 30 mph dance with glory or the pavement that is the sprint at the end of a cycling road race. Everyone for himself, pedaling like madmen, sweat pouring over straining red faces, the lungs blazing like bellows, heartrates at 200+, the world coming at you oddly in slow-mo. I was getting the perfect lead out, absolutely perfect, and the guy in front was just beginning to slow, giving me the perfect time to accelerate past with lots of slingshot and pick off the last 3 or 4 riders up front, who would never see me coming up on the right as they contested among themselves for the win, never guessing they were about to be overtaken. It was perfect. I was up on the pedals, leaning over the bars, the bike rocking back and forth underneath me. I had 'em, I knew it, it was perfect, here I go, here comes the open win I'd been wanting...now the horizon is tilting down to my right, what's going on? it tilts more, keeps tilting, I seem to be losing contact with my bike, what the hell? I'm falling! 25 yards to go and I'm falling, and I'm aware of a great weight on my left pressing me down and down and I am pushing against the rider falling on me, but we are both going down, helpless and I am thinking of my wife and little son, and the fact that she just told me a day ago that she is pregnant, and I have just started a private practice and if I hurt myself very badly, I am a dead duck, what the hell are you doing, Dolan? There are people who need you, why are you out here risking life and limb for a trophy? good question and the horizon is now tilted vertical and I am down, my helmeted head striking the pavement and bouncing once and what had been slow-mo is now real time and I hear people hitting the ground and bikes grinding and riders yelling and spectators yelling in shock and it seems to go on and on and I roll over in time to see a teammate of mine still on his bike place his front wheel in my rib cage and I watch him from the ground as he grimaces and squeezes hard on both brakes to no avail and upends himself over me as he rolls up my ribs ( I will wear the S shaped path his wheel inscribed on me while breaking my ribs for 6 weeks) and then tumbles to the asphalt beyond me. I rise, and grab my bike, hopelessly pretzeled. I throw it down, disgusted, and a teammate rolls his out to me, and I mount up amid the wasteland of stunned, groaning riders now sitting up or just lying on the ground, bent and ruined bikes all around. I roll through the finish line, never even seeing which lucky back marker capitalized on the crash and got the win. I never knew what happened. omebody lost control, and then everybody did. I got off the borrowed bike, went and sat down, and looked at myself, the right shoe almost ground off, the road rash ascending from my right ankle to my right shoulder, the skin suit in ribbons, my head aching from pounding on the pavement, my ribs stabbing with every breath, enough skin missing in places to see the underlying layer of fat. My bike a ruin. That was April, 1985. It took several weeks for the road rash to become tolerable. I had to wear shorts to work because of the constant ooze. I raced several more times that year, but the crash gave me a perspective that I'd never had, and I never raced with that much abandon again. 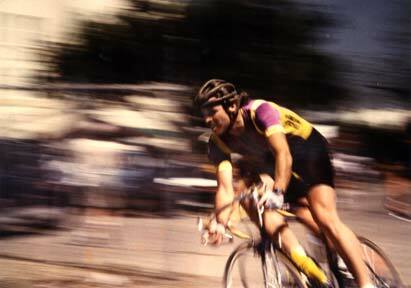 In the fall of 1985, I raced a criterium at City Hall in downtown Dallas, made several big breaks off the front, all of which were closed on by my own teammate (he'll remain nameless). I finished in the pack and that was it for me. Once I stopped racing, I stopped riding too. I raced my last triathlon in summer 1986, hated it, and went into a pattern of working out on my own, swimming at the Y, doing a little running, a little bike riding. Fall 1989. I'd swum enough to want to enter a masters swim meet at the Y. I had a great time, was amazed at how hard it was to swim fast, and decided I'd start looking around for a Masters club. My good friend Stewart was working out with the Lone Star Masters club, started by Olympic Gold Medalist Jim Montgomery. I just couldn't make those crack of dawn workouts, though. I needed something different. One day I was looking at the sports pages and saw a little ad that read: Masters Swimming? call Jerry at 392-SWAM. Jerry turned out to be Jerry Heidenreich, multi-multi- Southwest Conference Champion from SMU, Pan-Am Games gold medalist, world and national record holder, Olympic gold, silver and bronze medalist in 1972, 1990 inductee into the International Swimming Hall of Fame. His silver medal came behind Mark Spitz in the 100 free. Spitz got him by the length of a forearm. To this day, I can't see that tape without going C'mon, Jerry, C'mon, get with it! He had a Master's club at the Cooper Aerobics Center, and you could join the swim group without going through the Cooper Center brouhaha. Best of all, workouts were daily at 11:30 am. I could not believe how strenuous an hour of swimming could be. I was astonished. I had ridden my bike for an hour at 25 miles an hour in time trials, been in criteriums ridden at breakneck speeds, run 10k's at sub 6 minute pace, but nothing seemed to compare to the gut busting difficulty of swim workouts. Naturally, I was hooked. Jerry had established a reputation as a teacher of technique over raw power. He reasoned that Masters swimmers could benefit more from technique than being trained to exhaustion. Although, we also frequently trained to exhaustion, too. Jerry's Masters swim club at the Cooper Fitness Center is called SWAM. Meaning, Swim With American Masters. Has to do with his fascination with acronyms. It began when he and the Cooper Center agreed in 1989 to put together a Masters club as part of Dr. Ken Cooper's commitment to lifelong aerobic exercise. I have been a part of a small core of people who've been there since the beginning of the club who have seen many changes in its composition. When I joined there was a large contingent, both male and female, of post collegiate swimmers in their late 20s/early 30s looking to keep their competitive flames alive in Masters' swimming ('Masters' being the sanctioned, organized sport of competitive swimming in which adult swimmers outside of NCAA, USS, and FINA compete in age group blocks beginning with with 19-24, and so on up the age group ladder). I fell into this group, and their superiority in the water to me really helped me to develop quickly. It was very challenging. Since 1989, this group has followed the itinerant way of many Americans, dissolving over the years with moves and marriages and kids and so on. But not before we won the overall team championship at the South Central Zones of 1993.
a very supportive and stabilizing force in my life. In 1996, Jerry asked me o start coaching the club in the summers while he was involved with other projects. I've enjoyed this enormously, and appreciate the trust he has put in me to carry this responsibility. SWAM continues to be a part of my family. One time, we were attending a meet and I had some poor races. He came up to me and asked me what I was thinking about. He listened patiently as I explained Well, I am thinking about this and that, and getting good turns, and kicking on the 3rd lap, and .....Nodding as he listened, Jerry waited until I was done, then said, Don't think. And then turned and walked away. on't think. In swimming, if you are thinking, you are slowing down. Don't think. I made rapid progress for several years, up until about 1995. Jerry's skill as a coach is to be able to know exactly where any given swimmer is at any given time during the year, and to know exactly what they need to improve. Once, Jerry and I swam next to each other in a heat of the Lone Star Masters Sprint Classic. All races were 50 meters (short course) in length with the exception of the 100 IM. We swam the 50 free. Are there any other participant sports, amateur level, where a guy who never competed in college can be going directly against an Olympic gold medalist? Not that I know of. Anyway, I told myself that if I could see Jerry as he came off the wall at the turn, I would be swimming a good race. We got to the wall, and sure enough, I saw him crouched on the wall, leaving just as I went over about 2/3rds into my own turn. Good! Wow. Push off, kick out, sprint. Where'd he go? Gone. Gone gone. Stretch, hit the wall, Jerry is leaning over the rope, already there, the announcer is saying Jerry has just set a new world record, a 24. and change, Jerry is saying Congratulations, Jim, great race! High moment for me. I swam a 27.1. A little over two seconds between me and a world record. A barely noticeable spot of time, an eternity in swimming. Another area in which Jerry excels is in training kids to compete. In the summer of 1997, I had just come home from the Zone Long Course Championships in Ft.Worth. I swam well enough to set an age group record in the 50 free, and to win the 100 free. I was pumped. Jerry called to see how we did, as he had been out of town. He told me he had just started the ATAC swim club for age group swimmers, would I be interested in being on the Advisory Board? Yeah of course. To find out about the ATAC, follow the link http://atac.swim.com.